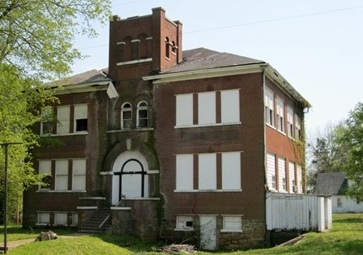 The Jefferson School in Cape Girardeau was constructed in 1904 and is the oldest public school building still standing in this City. For some time before the court-ordered racial integration of schools in 1955, the Jefferson School also served as the only high school for African-American students. The Jefferson School is threatened by years of abandonment and neglect. During these years part of the roof has collapsed, exposing the building to the elements and deleterious effects of water infiltration. The building will need extensive repairs in addition to the roof. If these repairs are not completed in the near future, it will continue to collapse. The neighborhood in which the Jefferson School is located is near Southeast Missouri State University’s new River Campus, and there is also local concern that the building might be threatened by the University’s plans for real estate development. A local developer that is experienced in the reuse of school buildings has been identified, but due to the extremely poor condition, the developer is hesitant to purchase the building at its current asking price of $60,000.00. The William P. Thomson House, constructed c.1834, is the oldest building in Grundy County. Located in the vicinity of Trenton, this brick and stone home, known as an “I” House, was constructed of bricks fired on the property. This estate included not only this substantial home (by 1834 standards) but also contained a slave quarters and the family cemetery, as well as an in-ground food storage structure, 12 feet by 25 feet with a vaulted stone roof. One room of the house was used as a medical office for Dr. Thompson, who traveled widely in northwestern Missouri in his practice of medicine. The home was also reported to be quite the social gathering place of the community, with its circular carriage drive and finely appointed rooms. The Thompson tract was acquired by Missouri State Parks and incorporated into the Crowder State Park some years ago. The house, its outbuildings and other structures have suffered severely from abandonment and lack of care and maintenance. It was discovered in 2009 that the Park system had decided to preserve and interpret the Thompson House site as a ruin. Enter the Friends of the Thompson House, who have tirelessly advocated for the restoration of this home that many had simply written off as already lost. The group successfully gained title to the house and adjoining acreage, and has so far raised $40,000.00 to put toward its restoration. Realizing that this is far shy of the amount needed for a restoration, the group hopes that they will be able to raise additional interest, and hence additional funds by this listing on Missouri Preservation’s list of Most Endangered Historic Places. Delmo Community Center (Pemiscot County) The Delmo Community Center is located in the tiny community of Homestown in the Missouri boot heel. 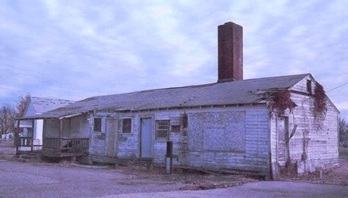 It is a utilitarian style frame building clad in clapboard siding, and sits on a concrete block foundation. While not a high style building, the Community Center is on the National Register of Historic Places , having its significance in the area of Politics/Government, Social History and Ethnic Heritage. The community center was the historic, social and political center of Homestown, originally known as South Wardell. It was one of ten communities constructed by the Farm Security Administration for displaced sharecroppers and tenant farmers following the January 1939 roadside sharecropper demonstration in Southeast Missouri. The demonstration brought national attention to the plight of sharecroppers, and the construction of 10 Group Labor Home communities (6 for whites and 4 for blacks) was part of the compromise reached between federal and state governments, local planters and sharecroppers, and representatives from the Southern Tenant Farmers Union to alleviate poverty and unemployment among Southeast Missouri sharecroppers and farm laborers. Homestown, was the largest of the communities and was designated for use by African Americans. When Congress demanded the liquidation of all FSA properties in 1945, Delmo tenants and a group of St. Louis philanthropists organized the Delmo Housing Corporation to purchase the communities, and make the housing units available for sale to occupants. Though 8 of the 10 original Delmo communities are readily identifiable by their layout, most of the original 595 residential units have been demolished or extensively altered, and several of the communities have lost their original utility buildings/community centers. 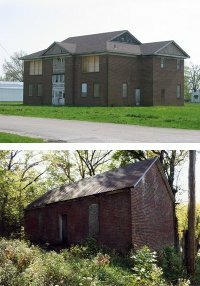 Though deteriorated, Homestown’s Delmo Community Center continues to be an important feature of Southeast Missouri’s Delmo communities, and represents an era of community building and social experimentation sponsored by the Federal government. The Hodgen School is located in the “Gate District” on the Near South Side of St. Louis. Designed by Otto Wilhelmi and completed in 1884, the school was Wilhelmi’s first, if not only, design for a new school building in the district. The construction of Interstate Highway 44 in the early 1960s isolated Hodgen and the northern part of the Compton Hill region, driving away many residents and spurring waves of demolitions. In 1991 the City of St. Louis commissioned the nationally-renowned firm Duany Plater-Zyberk to execute a redevelopment plan for the area. Their plan called for extensive infill construction and historic rehabilitation of remaining buildings, and branded the area “The Gate District” while identifying smaller neighborhoods within its boundaries. Hodgen Elementary continued to serve the area, receiving over $400,000 worth of renovations in the late 1990s before the school district constructed new facilities to its immediate west in 2001. The original Hodgen Elementary was subsequently closed, and has been vacant since. It remains the Gate District’s sole historic school building, and although an excellent candidate for rehabilitation, the school district currently plans to demolish the building for additional parking and recreational facilities for the new school building. There is strong local opposition to demolition. Neighborhood residents and preservationists have sent letters of opposition to the superintendent and to the Special Administrative Board. The Landmarks Association of St. Louis sent the superintendent a letter of opposition and covered the building in its spring 2011 newsletter. The Oak Grove Mausoleum and Chapel are located within the Oak Grove Cemetery. The mausoleum was designed by St. Louis Architect and Artist Tom P. Barnett and Sidney Lovell of Chicago. This Byzantine style domed structure was completed in 1928 and further additions were made in 1932, 1938, 1947, 1957 and 1971. Today the building is nearly 1/8 mile long and holds nearly 6,500 crypts and hundreds of niches for both human remains and ashes. There is a central rotunda. Its 22k gold leafed dome is fashioned after that of the Pantheon in Paris. The mausoleum is furnished with many museum quality sculptures and miles of the world’s finest carrera marble. Hand wrought bronze gates lead to the many private and semi-private family rooms. The chapel, completed in 1940, was designed by Sidney Lovell in the Tudor Gothic style. In addition to the chapel and small collection of niches for cremains, the chapel also contains a crematory in the lower level. Both the mausoleum and chapel suffer from deferred maintenance and lack of funds for adequate restoration. Water infiltration has caused severe damage in the mausoleum, with pieces falling of its marble-clad walls and discoloration of several of the crypts. There is severe damage to plaster and finishes. Vandalism has also been a problem, with many copper gutterings and downspouts stolen which is causing further water damage. It is hoped that by calling attention to the Oak Grove Mausoleum and Chapel on Missouri Preservation’s Most Endangered Historic Places, this non-profit will be able to raise funds for its restoration. Bridges of Missouri, Riverside Bridge (Christian County) and Route 66 Bridge (St. Louis County). 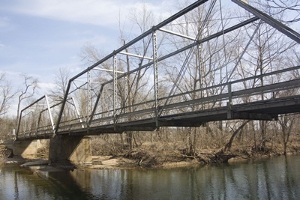 This combined listing has been formulated as many of our historic bridges are being lost to the rush to build new roads and infrastructure, to the idea that newer is better and old means obsolete, and to the fact that, due to age, the time has come for major restoration efforts at Missouri’s historic bridges. The 1909 Riverside Bridge carries Riverside Drive over the Finley River outside the town of Ozark in Southwest Missouri. This made it possible for the component parts to be fabricated and shipped to the site, and also made it possible for this type of bridge to be easily disassembled and moved. Unique in that it is a two-span bridge, and given the fact that many bridges of this type have been lost at an astonishing rate makes this a bridge worth saving. The Riverside Bridge has recently been deemed eligible for listing on the National Register of Historic Places. It is hoped that this bridge can be re-used in Christian County as part of its Ozark Park Trail. 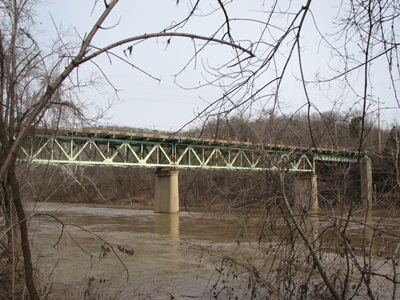 The Route 66 Bridge over the Meramec in Southwest St. Louis County was constructed in 1932 and is known as a Warren deck truss bridge, of which only three other examples remain in Missouri. Route 66’s passage across the Meramec River was heavily promoted as a tourist attraction due to the river itself, as well as the adjacent working class resort community known as Times Beach. Although major highway traffic is now carried over the Meramec by the Interstate 44 Bridge, the Route 66 Bridge was incorporated into the boundaries of Route 66 State Park, which opened in 1999. Being one of the most visited State Parks in Missouri at around 250,000 visitors per year, park attendance has dropped since the bridge’s closing to vehicular traffic in October 2009. There is strong support from a number of local and statewide groups to preserve this bridge. The preference of the Missouri Department of Transportation (MoDOT) appears to be the removal of the bridge unless another party assumes ownership and rehabilitation responsibilities. Fairfax House and the Rock Hill (United African) Presbyterian Church Rock Hill, (St. Louis County) . Fairfax, also known as the James Collier Marshall House, is a center hall Greek Revival home, also known as an “I House.” Completed in 1841, the home was named for Mr. Marshall’s former home town, Fairfax Virginia. The 1845 church building was actually built by Mr. Marshall and was the first church in the region, serving several adjacent communities. Originally built in a vernacular Greek Revival style, the church is among the oldest in the St. Louis metropolitan area. Membership was seen to decline and the church finally closed its doors in 2005. After being moved several times because of increasing commercial and residential development, the Fairfax House has ended up on another former Marshall property. 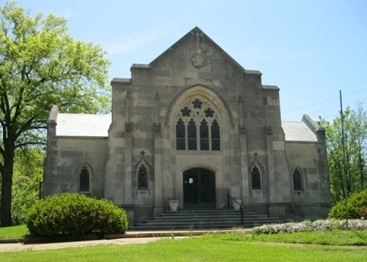 In February 2010, it was discovered that the Giddings-Lovejoy Presbytery was seeking to sell the Rock Hill Presbyterian Church, presenting a threat to the historic church building and an additional threat to Fairfax House. This property is now situated at the intersection of two busy St. Louis county roads. It is a target for commercial development as the City of Rock Hill, which does its own zoning and has no current historic preservation ordinance. Having lost the Grand Opera House to fire in the 1920s, the citizens of Lexington and Lafayette County were without a centerpiece for classical entertainment until the construction of their new facility in 1939. The Lexington Auditorium represents a rare WPA project in this area. 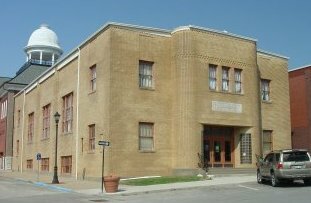 Listed on the National Register of Historic Places, the Auditorium sits on the southeast corner of Lafayette County’s historic Courthouse Square. Constructed of buff-colored brick, the auditorium’s form is basic and geometric. Its design elements, including a curved entrance portico with illuminated glass block sidelights, entry stone with modernist relief lettering and geometric foliage, and its International style windows all add up to a simply beautiful and graceful Art Deco Streamline Modern exterior. The design of the interior is likewise geometric and utilitarian, with Art Deco details in its theater seats. The overall condition of the Municipal Auditorium is quite good and the building had been in active use for its original purpose until this year when it was closed due to ADA accessibility issues. Its walls are solid and stable, the windows and doorways square and trimmed on the interior with birch and fir millwork in the original finish. Upgrading its facilities, including energy retrofit, addition of air conditioning and providing for handicap accessibility would ensure the building continues in its role as a central point and hub for community activities, entertainment and fellowship. This former hospital building was constructed in 1939 with funds allocated to the United States Public Health Service to combat Trachoma. This disease which affects the eyes was the leading cause of blindness in the United States and was particularly prevalent in a belt running from Kentucky to eastern Oklahoma. 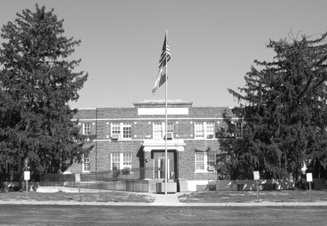 After closing as a hospital, the building was acquired by the Missouri University of Science and Technology (MS&T) and presently houses the University’s Rock Mechanics and Explosives Research Center (RMERC). The center is used for teaching and researching the basic problems in rock mechanics, explosives science, and engineering. The 2009 Campus Master Plan for MS&T calls for the former hospital building to be razed and replaced by a parking lot for campus recreational facilities. It is thought the general public is unaware of the demolition plans and has therefore not been able to comment, although it is widely reported that demolition plans have been ramped up for 2011. The red brick and terra cotta Russell Hotel was built in 1917 by Congressman Joseph J. Russell at a cost of $50,000.00. This three-story block on a raised basement was reportedly one of the finest hotels in Southeast Missouri, and unusually large for a town the size of Charleston. It was managed by John Marable who in 1921 purchased the hotel from Congressman Russell, paying for it in full. The basement level of the hotel was known as the “Cellar” and was a popular night club and dance hall, which over the years hosted some of the finest orchestras in the country. The hotel itself closed several years ago, but a group of partners purchased the building with the intention of creating a bed and breakfast in the former hotel. An art gallery and the first floor restaurant remained open until 2008, when the partners abandoned the building as a result of discovering that their rehabilitation loan had not been guaranteed. A developer would be welcomed with open arms by this community, which cherishes this historic site, one of the single largest buildings in this charming Southeast Missouri town. It is hoped that by nominating this building to the National Register of Historic Places a suitable developer might be drawn to the project as it would be eligible for Historic Preservation Tax Credits. The first railroad depot to be built in Fredericktown, the St. Louis, Iron Mountain and Southern Railroad Depot (1869) served as the town’s only freight and passenger depot for nearly sixty years. Fredericktown incorporated as a village in 1868 and served as the railroad’s “division point.” Numerous locomotives made their connections at Fredericktown, which supported a turntable and train repair shops. In addition to the production of iron ore, the community also shipped local agricultural products and livestock via rail. The railroad put Fredericktown on the main line of traffic and made this county seat town a place of considerable importance. 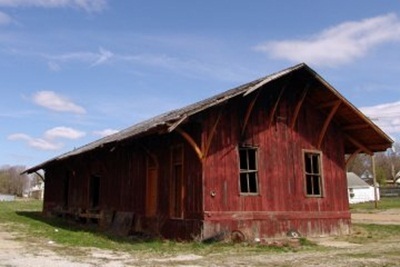 The St. Louis, Iron Mountain and Southern Railroad Depot, which was listed on the National Register of Historic Places in 2005, is in a state of severe neglect. The roof is falling in, doors are missing, there is no plumbing, heating/cooling or electrical service to the building. Decay is visible in the supports and foundations as well. The exterior envelope of the building is board and batten, and curving arches support the wide roof overhang. Some of these arches are missing or broken. The current owners of the depot have used the building for farm supply storage for many years. Vandals have done extensive damage to the interior, including the setting of a fire. In addition, a May 2009 storm has caused considerable damage to the roof. 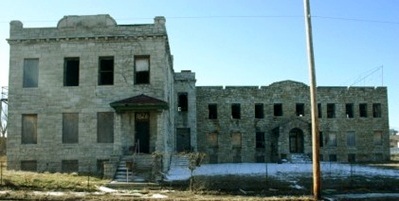 Wheatley Hospital has strong significance in terms of social history as the only remaining hospital building in Kansas City, Missouri that was established and run by and for the African-American community during the period of 1902 to 1972. Also significant is its association with the development of the medical profession within the African-American community in Kansas City. Run as a hospital and training school for nurses until 1972, the facility was founded by Dr. J. Edward Perry. As an example of local vernacular architecture, Jackson County limestone was used as a distinguishing design feature. The structure consists of two wings-the original structure built in 1902 as the St. Joseph’s Parochial School, and a second, north wing which was added in 1925 and was designed by the well-known architecture firm of Hoit, Price, and Barnes. 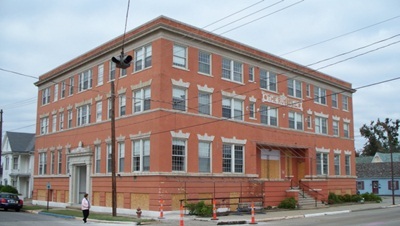 The Wheatley-Provident Hospital is one of the last living reminders that this part of 18th Street was once the center of African-American life in Kansas City and a contributing resource to the story of Kansas City Jazz and is the last remaining historic landmark building in an area that was largely destroyed by the urban renewal era. The Wheatley-Provident Hospital building is threatened by neglect and is currently listed as a dangerous structure. Constructed in 1870, this stately Romanesque style building was once home to the largest African-American religious congregation in Lafayette County. Through the years enrollment declined and the church lost its pastor. Without a replacement pastor being available, the Central Council of the African Methodist Episcopal Church in Kansas City ordered the doors closed in 2006. During this extended period of vacancy, the congregation has been scattered. 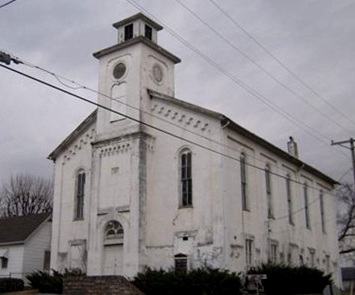 Vandals have caused damage to the empty church, further demoralizing the few remaining members.The building is now controlled by the absentee Fifth District Council of the AME in Kansas City, and there are no known plans for the edifice, or evidence of maintenance or upkeep. It is hoped that listing will help find a developer for this property. Missouri’s historic buildings tell the stories of the diverse spectrum of people who have lived in our state for hundreds of years. The variety of resources left by these groups enhances our understanding of Missouri’s history. African-Americans have played a significant role in the development of Missouri, and they have left numerous resources to tell their part of the story. Many of these resources reflect the era of segregation, when African-Americans studied, shopped, and healed in buildings separate from the white community. Although segregation brought an end to discriminatory practices, the many buildings erected during this period remind us of a less than ideal time in our past. Often vacant or underutilized these buildings need to be preserved so that we can remember the complete story of Missouri’s history. 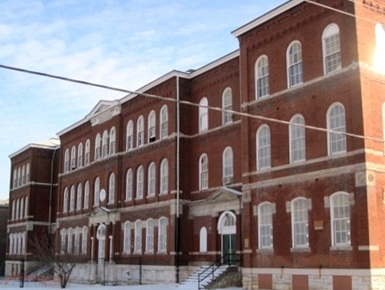 Schools built to educate Missouri’s African-American children are one particular type of historic building that is endangered across the state. Largely abandoned following the end of segregation, many have not found a new function and now face the threat of demolition due to years of neglect. It is important to save these buildings to remind us how through education we can teach current and future generations about the great cost of segregation, and the universal passion and desire for learning. This one room school house was built in 1885 to serve African-American students and was closed around 1905 when a two room school was built nearby. The school fell into private hands and was converted to a home. In the 1980’s Mrs. Lucille Douglass purchased the property to save it from demolition and deeded it to the Platte County Historical Society. Since then a new Banneker School Foundation was formed for the purpose of restoring the school building. The school is the first one room African-American school in Platte County and was originally built as an African-American extension of the college. It eventually became a primary school since the need was greater in this area, since the college found the African-American students were not prepared for college. Students attended from as far away as twenty miles. It is important to save this school to remind us of the importance of diversity and how through education we can teach current and future generations the great cost of the scope and depth of segregation as well as understand the passion and desire for learning. It is threatened by neglect, vandalism, a leaky roof and lack of maintenance. Lincoln School of Vandalia, Vandalia (Audrain County) Lincoln School was built in 1928 to educate a growing population of African-American children and was one of the largest schools to be located in a small rural town. It served as an elementary and high school building with four classrooms. It also contains an auditorium with seating for 131 people with a raised stage and floor lights. Abandoned in the 1950’s when segregation ended, the building has been acquired by a group calling themselves “The Concerned Citizens to Save Lincoln School.” The building was placed on the National Register of Historic Places in 1996. The building is in need of rehabilitation due to neglect and lack of funding to complete repairs. This is the only remaining historic school building in Vandalia, all other have been torn down. Additional African American schools have been identified throughout Missouri, including the Lincoln School in Canton, the Howard School in Warrensburg, the Wheatley School in Poplar Bluff, and the George Washington Carver School in Fulton. The Williams Gierth House in Poplar Bluff: As a perk of Missouri Preservation membership, you can list your historic property for sale on our web site. Such was the case with the Williams-Gierth House, (a.k.a. The Castle House). The current owner saw the listing on our web site and purchased the house in late 2011 with the intention to restore this wonderful Victorian. 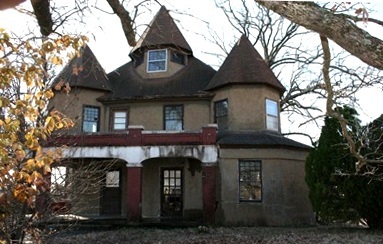 In addition, Darren Bell, a graduate student in Historic Preservation at Southeast Missouri State University has nominated the building to the National Register of Historic Places, which will make it eligible for the state’s Historic Preservation Tax Credit. 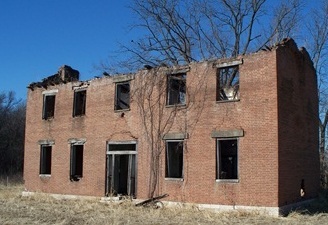 The Jefferson School in Cape Girardeau: In late 2011, the City of Cape Girardeau issued an order to remediate structural deficiencies at this building or demolish. Missouri Preservation worked with local liaisons to urge owners of this building to gift the building to a non-profit that might be interested in renovation. The Prodigy School received the building as a gift and initially planned to renovate it for use as an educational facility again. The new owners may be thinking about building new, so we are hoping they will decide to sell the building to another party for rehabilitation before deciding to demolish. Hodgen School in the City of Saint Louis: The Transitional School District of the City of St. Louis Special Administrative Board voted on February 16, 2012 to expend almost three quarters of a million dollars to demolish the Hodgen School for a playground and parking lot. This represents what we feel is a tremendous waste of a useful building in a (currently non-accredited) school district which is already financially strapped. The building is in an area of St. Louis which is known for its vast tracts of vacant land, so the district need not look very far for available playground or parking space. William P. Thompson House in Grundy County: A local organization has acquired the Thompson House from the State Division of Parks and has already raised tens of thousands of dollars to restore the house for use by the community. The house is now ready to receive a replacement roof and windows as supporters have recently completed restoration of all the brickwork and foundation. They have also been milling and installing oak floor boards from locally raised timber. This is going to be an amazing transformation of an historic house that sat in ruin for many years! The Route 66 Bridge in St. Louis County and the Riverside Bridge in Christian County: The Route 66 Bridge received a grant in 2011 from the National Trust to perform a feasibility study. Since then, the group has gotten another grant from the National Park Service to perform an historic structures report. The State Department of Transportation has been supportive of their efforts. In Christian County, Section 106 Review should begin soon as Christian County is discussing the construction of a new bridge at the current site and moving the historic bridge to dry land alongside the new bridge and roadway. 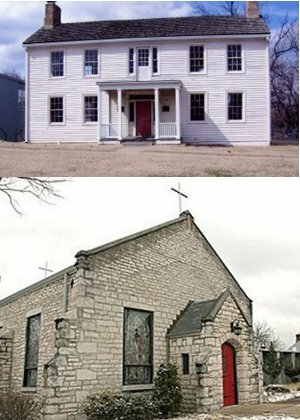 Fairfax House and the Rock Hill Church in St. Louis County: The Giddings-Lovejoy Presbytery sold the property on which these two building sits in 2010. The City of Rock Hill granted permission to Fenton-based UGas to construct a gas station on the current site of these two landmarks soon after. UGas agreed to move the Fairfax house, but not the church, and gave locals one year in which to find a new owner. The group was unable to raise the funds necessary to move the church in the short time allowed. It looks now like Fairfax will be moved to city-owned property elsewhere, and that the church will probably be destroyed and its building stone reused for a chapel at a winery near Foristell, Missouri. The Russell Hotel in Charleston: The Russell Hotel was nominated to the National Register of Historic Places by Tiffany Patterson of the State’s Historic Preservation Office. It is hoped that this listing might attract a developer who might be interested in using the State Historic Preservation Tax Credits to renovate the building for future use, perhaps as housing. The Lexington Municipal Auditorium in Lexington: The non-profit Lexington Auditorium Association was formed and the City of Lexington has recently agreed to grant them a 99-year lease. After it is passed into ordinance on April 10, 2012, a major donor campaign will be kicked off, utilizing the State’s Neighborhood Assistance Program (NAP) Credits. The building will be retrofitted to meet ADA requirements and the auditorium returned to its original purpose, hosting both private and civic functions. Zion AME Church in Lexington: The Zion AME Church building has been vandalized a couple of times since its listing on our Most Endangered list, but the community has come forward to repair and stabilize until a suitable new owner can be found. Discussions are currently being had with the Wentworth Academy, a college-prep military school about acquiring the building for incorporation into their campus. The community is considering building a new hospital, and Wentworth is interested in acquiring the old hospital building. The church sits on land in the middle of the old hospital and the Academy, so the structure would be a natural addition for use as a chapel or repurposed for a new use.